This was the first time I have ever had to design for a digital/physical blending of mechanics, and in the process I discovered that there was a lot we needed to take into account due to the peripheral device and the age of the players. We ended up designing three games targeting early readers, some of whom may just be learning what letters are. The age range was 2-7 year-olds, depending on the game. Our first game was Bubbles, which asks players to find and place the letters that belong in a three-letter word to unlock the reward of a screenful of poppable bubbles wobbling around. 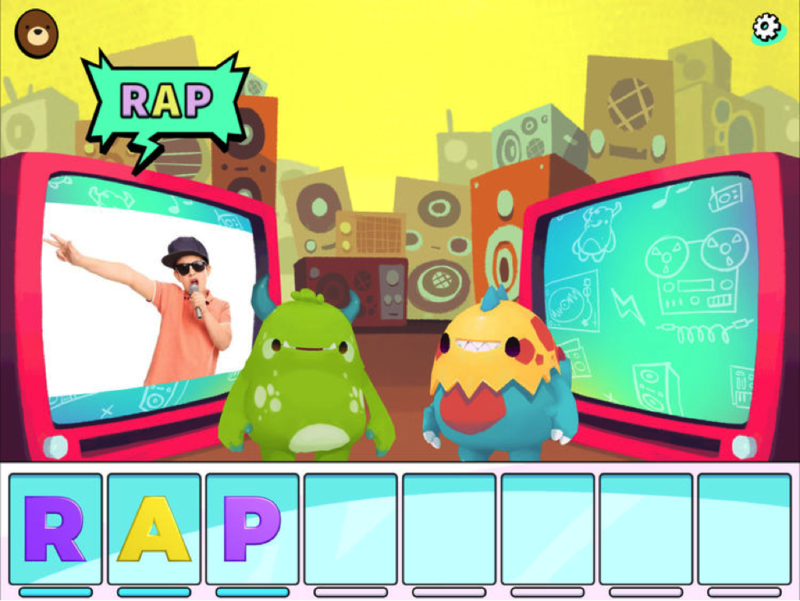 Next was Monster Rhymes, a rap-inspired rhyming game that both teaches kids about rhymes and lets them practice making their own. Jiggity Jamble, the final game, gets kids up and dancing to choreographed songs about words they spell. Each game struggled with many of the same challenges relating to the blend of digital and physical interactions. When you design a digital game, you are in complete control of what the player can and can’t do at any point in time. You can disable buttons, hide pieces of information, point at things you want them to touch, etc. These are things you can’t do with a physical device, like the Square Panda tray. 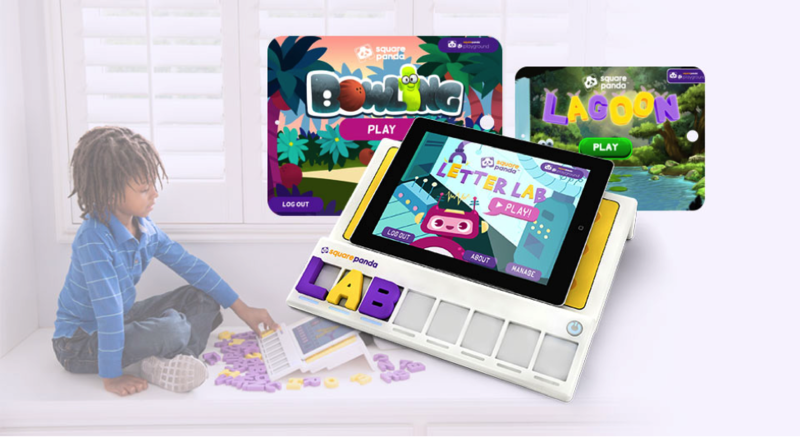 Kids can do anything they want with the device and letter pieces at any time, and the game can’t stop them. The digital experience needs to both clearly direct the player on what they should do with the letters and react to spontaneous actions they may do. We started by visually connecting the device with the digital game on the screen. The device has a white tray of eight gray letter slots that each have a blue light below them. Each game has a matching visual of the tray on its screen so that the player knows that the game and the device go together. When the player places a letter in the tray, they see that same letter appear on screen in a matching typeface and color. This is part of the fun too. Kids like seeing how the game reacts to their actions in real life. Because anything goes in the physical space, players can place letters incorrectly in the tray. It could be the wrong letter, it could be upside down, it could be in the wrong slot on the tray, or any combination thereof. They could even decide to move letters or rearrange them at any point in the game. We opted to have immediate feedback that walks the players through correcting their mistakes the moment they make them. There are often visuals, text, and voice-over working together to tell the player what happened and how to fix it. We make the lights on the tray and screen blink by the letters and slots that the player should interact with to help draw their attention. The Square Panda device only has so many letters. That means certain words are off-limits because there aren’t enough letters available. This is another limitation to a physical peripheral. All the words in the game need to be able to be written using the letters the player has access to. If the player has lost a letter, they can mark them as lost and the game will automatically fill in the missing ones for them, allowing the player to continue playing. Even though there are only 2-3 pieces for each letter, the total number of letters is huge for a small child. They have a lot of pieces to sift through. The game can’t rush the player, and it needs to reward them for finding the correct ones. We kept the words short and the feedback big so that younger players didn’t mind having to hunt for a while to find a particular letter. When you make a game with lots of pieces for a target audience of small children, you run the risk of them losing pieces. We even lost some letters somehow while playing with it in our office! Luckily, Square Panda thought ahead. All the games let you mark letter pieces as missing, meaning the game will fill them in automatically for you. The Square Panda games use both physical and digital technology. We wanted to use each to its strength. The core gameplay focuses on the letters and tray, but a game like Bubbles will reward the player with the digital interaction of popping bubbles on the screen. 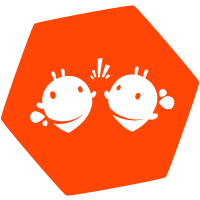 Kids love the variety of interactions, and we love it because it keeps them engaged. Jiggity Jamble takes it a step further and encourages the player to stand up and do the dance moves along with the characters on the screen. We found a way to use the digital technology to affect players in the physical space. Designing around hardware is not impossible, and in fact presents many unique interaction opportunities that only hardware can facilitate. A physical device can enhance play and open new doors for learning and interactivity. The games we created for Square Panda and its letter tray go beyond what many of our digital games have done, and players find them exciting and engaging. I look forward to trying my hand at more games that incorporate new hardware.